"Shadows of Liberty offers a brilliant, riveting and deeply disturbing insight into corporate control of American media and American public opinion. It is a clarion call to citizens to take back the First Amendment before it is lost to them forever." "After watching this film, you might think the greatest threat to free speech today is the media itself. Shadows of Liberty takes a critical look at the modern media landscape. Jean-Philippe Tremblay dissects the media's coverage of some of the biggest events in recent history. He tells the stories behind the big stories and contributes to a meaningful discussion of important public issues and the role of the media in this discussion." 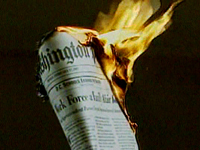 "The timing couldn't be better for a theatrical documentary about a corporate media monopoly in American journalism." "An excellent exposé of the corporatisation of the American media, and perhaps the very best of the [Leed's International] festival in toto. Frightening, enlightening, anger-inducing, thrilling, this debut from writer/director Jean-Philippe Tremblay ticks the boxes for what every great political doc should be...Stories of corporate greed winning out over media values are hand-over-mouth shocking, told with clarity and focus." "Deals with one of the most critical issues of today...A masterpiece of craftsmanship." "A slick, masterful political essay on the degradation of contemporary journalism...Rises above its contemporary counterparts by concentrating on convincing and compelling evidence." "A pull-no-punches kind of film." "A documentary indictment of America's media echo chamber...Artistry, cinematic or otherwise, and clear-eyed political vision rarely come this close together. Shadows of Liberty as a film, and Jean Philippe Tremblay as auteur are both definitely newsworthy. Stay tuned."